Style matters. Television relies on style—setting, lighting, videography, editing, and so on—to set moods, hail viewers, construct meanings, build narratives, sell products, and shape information. Yet, to date, style has been the most understudied aspect of the medium. 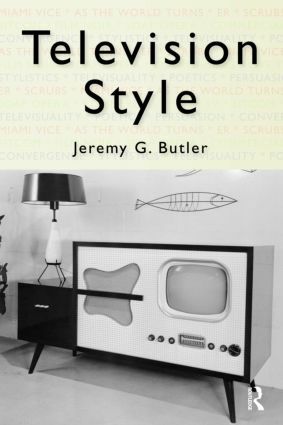 In this book, Jeremy G. Butler examines the meanings behind television’s stylstic conventions. Television Style dissects how style signifies and what significance it has had in specific television contexts. Using hundreds of frame captures from television programs, Television Style dares to look closely at television. Miami Vice, ER, soap operas, sitcoms, and commercials, among other prototypical television texts, are deconstructed in an attempt to understand how style functions in television. Television Style also assays the state of style during an era of media convergence and the ostensible demise of network television. This book is a much needed introduction to television style, and essential reading at a moment when the medium is undergoing radical transformation, perhaps even a stylistic renaissance. Discover additional examples and resources on the companion website: www.tvstylebook.com. Introduction: Dare We Look Closely at Television?